Gopro video of the newest lava flow ocean entry at Kilauea volcano Hawaii Volcanoes National Park. These started a few hours before dawn Tues Aug 9th. This footage was captured at sunrise looking directly into the sun. When I first arrived the flow was just starting to cross the road in a very wide swath of fast moving lava. These types of flows put out an extreme amount of heat. As usual with this summers weather, it was very windy. 30+ mph most of the time. The Gopro’s waterproof casing helps mute the strong winds. My Nikon’s external mic on the other hand is very sensitive and a dead cat wind screen wasn’t enough. I’m currently editing footage from my D800. Once the lava reached the ocean in multiple locations the steam plumes were engulfing the entire coast and inland area as the winds turned more onshore. This will be shown in great detail in my Nikon video clips. Two new photo galleries added to my website. This one is from my lava flow hike back on July 26, 2016. When the first ocean entry started. I decided to do something different with this gallery. I added the buy Now option directly to all the images and also have options for cropping and sizing. People often like to purchase prints from my stock photo galleries so, this makes it easier from the start. You’ll also notice a variety of swirling ocean plume images. There were too many good ones that are unique in their own way so, I decided to add them all. I shot very few images for how long I was out that night/day. Maybe 50 total. The other gallery is something I never expected to be posting. Fourth of July fireworks images from Kailua Kona’s 2016 event. Generally the show lasts maybe 8 – 10 minutes so, there isn’t much time to get it right. Its a popular event over here so, it was very crowded at every vantage point. They had a real nice variety this year as you’ll see. I usually just watch vs shooting photos or video. Shot video a few years ago. Be sure and check them out. All prints are available for purchase. I’ll be getting a few on metal for my place. I’ve been out capturing footage often so, I’m at least 3 visits behind in editing and posting. Thanks for subscribing and watching. Comments are always welcomed. Many more photos & videos to come. If you’re able to hike 8-9 miles, go see this in person. Stay away from the edge of the sea cliff. I know this area very well so, I also know where not to go which is the most important thing. Always be aware of what’s going on inland of you. Large breakouts can suddenly occur. Longer versions of each clip available. I’ve added a new video from a recent lava flow hike. This is the front of a fairly large A’a lava flow. This part of the flow was slowing down and would eventually stall but, that allowed me to film without having to constantly retreat. You will see how an A’a flow advances. The inner core is fed by a very large river of lava about a 1/4 of a mile back that was cascading down a steep pali (cliff). As the flow reaches an area of resistance the flow rises in height. A’a flows generally run at about 1700f. The outer portion cools in jagged pebbles to boulders. They roll off as it slowly advances. The flow front ran between 10′ and 15′ high. It sounds like dishes breaking. This type of lava flow also puts out a tremendous amount of heat that radiates out quite far. I had to be quick when placing the camera. Notice the tiny GoPro in the first still image right after the intro. Shot with my Motorola Droid Turbo 2. All video clips shot with a GoPro Hero 3+. Shot at 1080p 60 fps. Upsampled to 4k 60 fps. Edited and produced in Cyberlink Power Director 14. Feedback welcomed on how the up scaling looks to those watching on a 4k monitor or TV.. This is a test to see if it works well enough for now. Of course, this takes quite a bit longer for YT to process to full scale. Deciding if its worth it or not. Upload time isn’t an issue. Twice the camera shut down due to excessive heat. The rear LCD attachment melted slightly and is now tacky to the touch. Also melted part of the waterproof housing. Unfortunately there were steady 30 mph winds this visit. With this wind came lots of dust and tiny rock particles in the air. So, I stayed up wind as much as possible when shooting. Prints can be purchased locally at Krazy About Kona in the Kona Inn Shopping Village. 75-5744 Ali’i Drive. Two shops south of the Kona Inn Restaurant. So many things can go wrong for those who don’t understand or can’t recognize the dangers of an eruption of this type. Stay away. Follow my blog and Youtube channel and stay safe. As of now the NE flow activity has stopped so, not much to see now anyway. My latest video from the last breakout of lava on the north side of Pu’u O’o vent was recently shown on the TV show “Right This Minute“. I found out after the fact but, it can still be seen online at the above link or click on the photo. They show interesting videos from the internet. I’ve watched it often. Also, I’ve added images from that adventure to my Fine Art gallery, “Bryan’s Favorites”. Three are similar with subtle differences in slight motion in the lava flow, freezing the flows movement, more sky and less sky. I only offer options like this when a scene allows it. Each image has a different appeal. There are panoramic options too. The one with the blue flame is the pure sulfur gas burning. A rare sight at the Kilauea volcano lava flows. Images can be viewed and purchased here or click on the image below. New images are #’s 516, 516c, 517, 517c, 518, 518c, 519, 520c, 520cc and 521c. Some of you may have already seen the news reports and aerial views of the latest lava flows coming from Pu’u O’o vents north and northeast slopes. As usual I’ll give you a glimpse of what it looked like from the ground. I only shot a short amount of video and few images. Spent most of the time recuperating from the long hike and resting for the hike back. The heat from this type of flow is much more intense than the typical pahoehoe flows. It radiates out quite a bit further. So, getting close shots and video clips was tricky. I’m at the front of a half mile long lava river. The front had reached a relatively flat area allowing the flow to bunch up and slow its forward progress. This front would stall by sunrise and the pressure further upstream led to breakouts 1/4 of a mile back on the interior of the flow field. Look closely at the top of the video clips and you can see the large river snaking its way down slope. It was approximately 30′ wide. Too risky approaching that area. Especially with sharp turns in the river above and on a steep slope. Sudden and large overflows can cover up to a 1/2 mile faster than you can run. The flow front consisted of slabby pahoehoe. Look closely in from the front edge and you can see the river stirring up the flow. This causes large slabs to form. The scraping sounds heard are from the slabs being dragged along the cooled older flow. The sounds are similar to someone scraping their finger nails on a chalkboard times 100. The blue flames that appear early in the video were very unusual as there wasn’t any vegetation up that high to burn causing methane flames. The deep blue suggests possibly pure sulfur gases burning. This is something I had never seen before in the past 3 decades. There wasn’t time to change my lens for a closer shot as the flow quickly surged forward burying the flames forever. I also had to keep moving my gear far ahead of the flow. Throughout the visit steam was coming out from every crack up to a 1/4 of a mile from the flow front. All in all, a very relaxing and entertaining visit. Images from this hike can be seen here. I only took a few and only with my Nikon D800 and the 16 mm wide-angle lens. The video was shot with the same and the Nikon 180 mm for the helicopter shots. Those clips show the huge heat waves coming from this lava flow. Warning; The video is loud. This type of lava flow is much louder than the typical pahoehoe or a’a flow. The entire area behind the flows front is constantly churning as the force of the river pushes it forward. This also causes the cooling top layer to fold into large slabs and flip and roll. In its self it’s very noisy. When it flows over bare rock/cool lava it can be deafening. You have the popping and crackling sounds of a pahoehoe flow along with the sounds of breaking dishes from an a’a flow with the added noise from huge slabs of rock being flipped and dragged along. As of now the flow activity has diminished greatly so, not much to see now anyway. Please excuse the weird formatting. WordPress editing wasn’t cooperating at the time of this post. Hawaii Volcanoes National Park Kilauea volcano, Halemaumau vent eruption has escalated in recent days. The vent has started to overflow onto the crater floor. It’s quickly building into a perched lava lake. This could lead to all kinds of possibilities like filling the crater, large fountain vents, hornitos, it’s going to be interesting. Historic eruptions like this back in the 1800’s into the early 1900’s lasted 100 years. Might need to expand the parking lot if this follows suite. Or a shuttle system. What you are seeing is the filled vents boiling lava lake. The sounds are from rocks and gases being releases. The dark crusted plates are constantly moving and bumping into each other. That’s much of the clanking sounds. As the lava circulates within the lake gases release. The lake has since overflowed covering a huge part of the crater floor. It has a long ways to go to fill the crater. It’s presently 280′ deep. The viewing area is 1.2 miles away so, no close up shots can be had. When fewer people are there the sounds of rocks clanking or falling can easily be heard. Even some jetting sounds. Also crackling from the thermal expansion of the rocks above the boiling lake. The video below is as much about the subtle sounds of the lava lake as it is the visual. Watch at full HD setting with headphones. Shot with my Nikon D800, Sigma 120-300mm 2.8 lens and a Rode VideoMic Pro. Dolica professional tripod. 4-27-15 Nikon D800 video Halemaumau crater and vent. Click here or on the image to view the photo gallery. 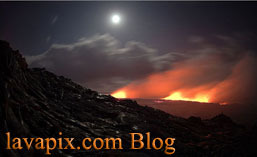 Be sure to view my images of past large perched lava lakes I was able to get up close to. Visit the links below. As it stands now, you won’t be seeing images nearly as good as what I shot years ago. The current viewing area is too far away. These were very rare opportunities that took tremendous effort to capture but, it was also extremely rewarding. The 2007 hike to the new and growing perched lava lakes came right on the heels of a 18 mile rt hike to Pu’u O’o vent where the fissure first opened. I hiked back down stopped at a friends for some sleep then we both did the 16+ mile hike to these lakes that would eventually turn into the TEB vent. I was pretty tired returning from the second hike. Be sure and subscribe to my blog for future photo and video updates. Prints #357c and #358c can also be purchased locally at Krazy About Kona in the Kona Inn Shopping Village. 75-5744 Ali’i Drive. Two shops south of the Kona Inn Restaurant. Now for my usual warning. Stay away from Pu’u O’o vent as its extremely unstable and there’s nothing to see anyway. The vent is constantly filled with thick fumes obscuring any possible views into the vent. Toxic fumes regularly surround the vent too. Visit Jaggar Museum and enjoy being able to view the distant lava lake safely and conveniently. Leave the drone home as national parks are a “No fly zone”. Aloha, Bryan Lowry lavapix.com All content is copyright protected ©Bryan Lowry/lavapix.com. Use without my permission is prohibited. All rights reserved. It’s hard to believe its been 10 years already since I captured my “Fire & Ice” image. You can read more about it on my website. “Fire & Ice” page. 13 years of planning and attempts that started in Jan 1992. After all that time and effort I had a mere 3 minute window of opportunity to capture this image. Its available in many sizes. To buy click here. Absolutely stunning on metal! 12 x 18 to 40 x 60. The earlier hike that year was even more interesting but, lost the majority of those images. That’s a story in its self. Also available as a poster on my website or at the Hawaii Volcano National Park visitor centers. Prints can also be purchased locally at Krazy About Kona in the Kona Inn Shopping Village. 75-5744 Ali’i Drive. Two shops south of the Kona Inn Restaurant.